Dreamworld faced almost A$2 million (NZ$2.13 million) in lawsuits in the years leading up to the rapids ride tragedy, with former park workers among those airing safety concerns. Court documents revealed the theme park on Australia’s Gold Coast, under pressure after the shock accident claimed four lives this week, faced more than half a dozen lawsuits since 2010. In a claim filed last year, one former staffer suing for A$400,000 claimed he hurt his back moving a “motor coaster” that park operators had known was defective for two weeks. Dreamworld will remain closed at least until Monday following the accident which claimed four lives. In 2011, a visitor sued the park’s operator, Ardent Leisure, for A$750,000 over claims it was at fault for the dislocated shoulder he suffered in a 2008 accident on the FlowRider surf simulator, resulting in long term injury. Along with at least four other cases in the past six years, both have been discontinued with any potential settlement figures unknown. Dreamworld didn’t respond to questions about the lawsuits but has consistently stood up for its safety record. On Thursday, it detailed several safety measures in place, defended its safety policies and procedures and promised to work closely with investigators. A spokeswoman for the company said all ride operators were trained to “specific competency standards”, rotated to prevent fatigue and a “unique” system prevented rides operating inadvertently. In Geoffrey Kelly’s suit, he alleged the FlowRider operator told him to jump onto a bodyboard by doing a “barrel roll” but he landed awkwardly. Inside the ambulance, he was allegedly dropped and landed on his shoulder again. Doctors’ certificates filed along with the claim recommended the Gold Coast man, who turned 39 on the day of the Dreamworld tragedy, stay in a splint for six weeks and showed him still recovering from surgery months later. “Motor coaster” claimant Leo Cassar said in July 2010 he and one other worker had been needed to move the vehicle because it was “pulling up short of the drive wheel”. Among a long list of criticisms over working conditions, he alleged Dreamworld “failed to have in place any adequate system of maintenance for the coaster cars”. In the same suit, filed in August last year, he claimed in 2012 he was required to place 20-kilogram sandbags into a coaster car for the first ride test of the morning. 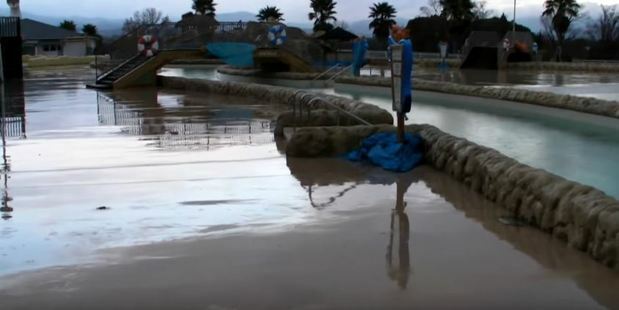 On Thursday morning, a spokeswoman for the park had said procedures and systems were benchmarked against international best practice, with rides and slides checked daily before opening. “If it’s not tested, it doesn’t open,” she said. Timothy Klumper wanted A$60,000 over a claim he hurt himself slipping on some wet stairs doing the pre-start testing of the park’s Temple of Huey water slide in 2009. Klumper claimed he had to do the job of two people in testing the ride before the park opened, taking a “dry run” down the slide to look for any problems before repeating it with water flowing. “The plaintiff had to rush to get the Temple of Huey water slide checked before opening of the theme park because there were only three staff undertaking the safety checks that morning,” his statement of claim read. Queensland Law Society president Bill Potts believed potential lawsuits from Tuesday’s tragedy could “run into the millions”, with one law firm saying it had already been speaking to allegedly traumatised witnesses. The Australian Workers’ Union said it had raised ride operations issues with the operator of the past 18 months but wasn’t happy with the results. Dreamworld on Thursday morning questioned the “nature and timing” of the criticism. Its lawyers have not been hesitant to defend against claims it disagreed with, citing the statute of limitations to fight one suit and using specific evidence to strenuously deny claims made in another. In other suits filed over separate incidents across the past five years, one staffer claimed a hand injury due to repetitive work and another claimed she’d been forced to walk steps despite the Dreamworld staff knowing she had an injury, which the park strenuously denied. Initial claims shown in Queensland District Court documents available to inspect on Thursday totalled $1.99 million. Meanwhile, it will be at least Monday before it’s known when Dreamworld will reopen. The Gold Coast theme park was scheduled to reopen with a “memorial day” on Friday, but that was ruled out by police who say the site remains a crime scene. Dreamworld’s claim that police gave the theme park advice not to reopen on Friday was an inaccurate description, Queensland police say. A statement released by Dreamworld on Thursday afternoon outlined that the cancellation of Friday’s reopening was to give the police service the time it needed for its investigation. Bouquets are now being left at Dreamworld in memory of the four victims. “Dreamworld has been advised by Queensland Police Services that we are unable to proceed with tomorrow’s memorial service as planned,” the statement read. The theme park will not reopen until at least next week, with an update expected on Monday. 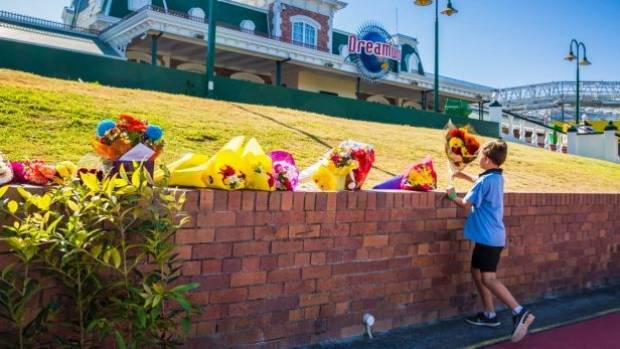 “We will provide an update to the media on Monday with regard to the memorial service and re-opening of the Park,” the Dreamworld statement outlined. However, a Queensland police spokesperson provided a statement on Thursday evening that outlined the Dreamworld’s statement was not accurate. “Unfortunately the statement was not an accurate description of how the decision was made to not reopen the park,” the spokesperson said. “We will provide an update to the media on Monday with regard to the memorial service and re-opening of the Park,” the Dreamworld statement read. 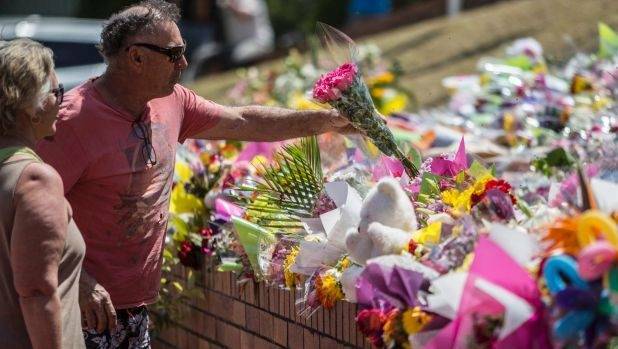 The cancellation comes after Dreamworld announced earlier this week it would be holding a memorial on Friday for the four people killed while on one of the park’s rides. Canberra mother Kate Goodchild, 32, her brother Luke Dorsett, 35, Luke’s partner Roozi Araghi, 38 and a separate holidayer, New Zealand mother Cindy Low, 42, were killed. Queensland Premier Annastacia Palaszczuk visited the theme park earlier on Thursday to pay her respects and said she had lain flowers for all those who couldn’t make it out to the park to offer support. While at the theme park, the Premier confirmed Police Commissioner Ian Stewart would be having a “conversation” with Dreamworld later on Thursday about the timing of the park’s reopening, while Police Assistant Commissioner Brian Codd outlined there would be discussions around the “potential impact” of opening. “What we want to do is to try and allow Dreamworld to get back to operations, that is not our intent to get in the way of that, but let’s be aware of what the implications will be for our ongoing security of the crime scene,” he said. Police and workplace health and safety are investigating. Expoland was thriving for more than 30 years but changed in 2007 with a single, tragic incident. After that it was never the same. It struggled to attract patrons, became a wasteland frequented by photographers fascinated with abandoned places and only recently showed signs of life again. Built in 1970, the park covered 20 hectares in Osaka and became one of the most popular destinations in Japan for thrillseekers. More than 20 years after the park opened, passengers took the first ride on the Fujin Raijin II, a six-car rollercoaster that travelled along more than a kilometre of track, twisting and turning at speeds in excess of 120km/h. It was a huge success and operated without issue for 15 years. Then, on May 5, 2007, it derailed, tossing passengers off the track and claiming the life of a 19-year-old woman. 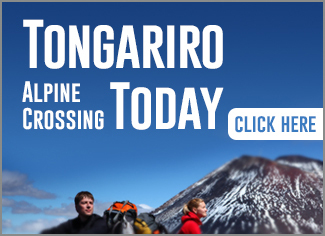 Yoshino Kogowara died instantly when her head struck a guardrail. 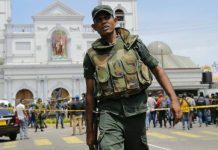 Eighteen others were injured. Expoland closed briefly as investigators pored over every inch of the track and eventually found fault in an axle that had not been replaced in 15 years. Operators said the axle should have been checked routinely, as it was every year, but an inspection scheduled for February that year was not completed. When the park reopened, nobody came. Less than two years later, it closed for good. The park’s fortunes were captured in a single quote from a spokesman. 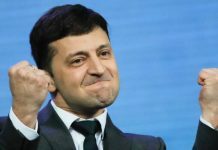 He told The Japan Times: “We couldn’t regain the people’s trust”. 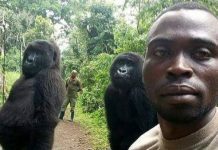 He said it was difficult to secure a corporate sponsor that wished to be linked to the park after the incident. Three employees at the park were charged with professional negligence resulting in death and injury and falsely claiming the park conducted regular checks on the roller coaster. They were found guilty on all charges. The rollercoaster was pulled down, and photographers took their chance to capture the once-popular playground in all its emptiness. In late 2015, six long years after it closed, Expoland reopened without hair-raising rides. Now, its drawing cards are a giant ferris wheel and a burgeoning retail and entertainment precinct. 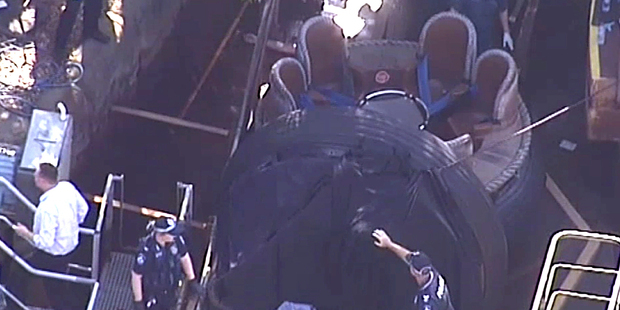 On Thursday, a day after four people died when a carriage flipped on the Thunder River Rapids ride at Dreamworld on the Gold Coast, tourism operators were in damage control, trying to avoid a situation like Expoland’s. 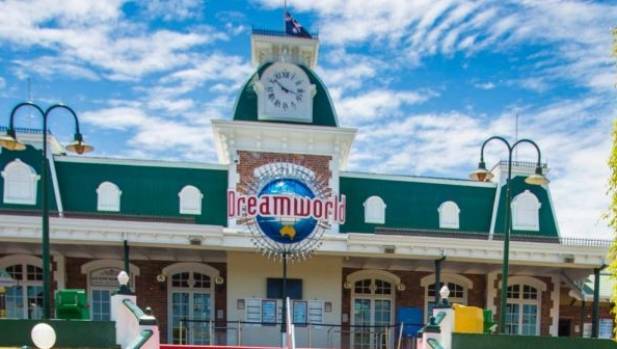 Queensland Premier Annastacia Palaszczuk and Gold Coast Mayor Tom Tate were doing everything they could to convince visitors to continue to frequent Dreamworld. “Dreamworld has been operating for many decades in this state, it is iconic on the Gold Coast and iconic to the rest of the world,” Ms Palaszczuk told ABC radio. Asked about the deaths of the four passengers – now identified as Kate Goodchild, 32, her brother Luke Dorsett, his partner Roozi Araghi and New Zealander Cindy Low – Mr Tate quickly moved the subject back to the park’s ongoing success. On Dreamworld’s website, a sombre message has been positioned in place of pictures of children and families enjoying a day at the park. The effects will be felt forever. In Japan, after Yoshino’s death, her mother spoke of her fury against those responsible. “I don’t forgive Expoland because it betrayed my daughter and other people who only wanted to have fun,” Miyoko Kogawara said. Dreamworld was scheduled to open for a memorial day today, with proceeds going to the Red Cross, but these plans have been shelved after criticisms as Queensland Police continue their investigations into how four people died on the Thunder River Rapids ride on Tuesday. It’s not clear whether plans are for this ride to open again in future. Queensland Police said they will investigate thoroughly. Dreamworld CEO Craig Davidson said park staff were “deeply shocked and saddened” by the tragedy and “our hearts and thoughts go to the families involved and their loved ones”.